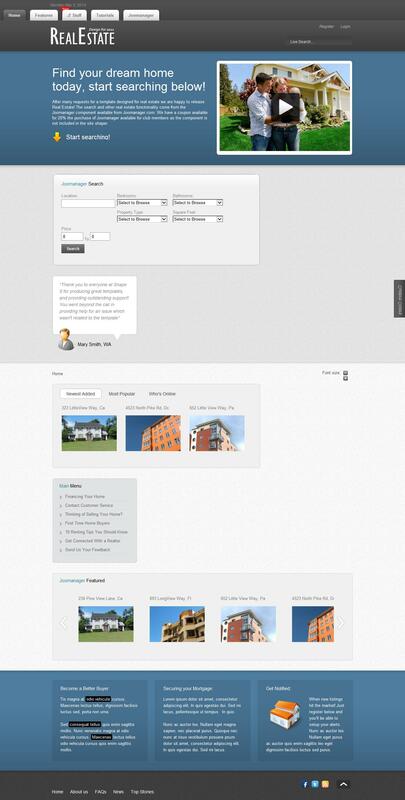 S5 Real Estate - magnificent and versatile template from the studio shape5, which will serve to create a website for real estate or other type of directory. This template is implemented 75 module positions, full compatibility with the component JComments, Tienda, Virtuemart, K2, Google Fonts. SEO optimization template has four built-in menu system, custom column sizes. If you want the template S5 Real Estate administrator can freely customize the color scheme design. A special section is enough to enter the HTML code required color and resource immediately change its design. Also, in this section and other options available to the pattern. All sections are equipped with a template comments from developers, so deal with all the settings were not working.